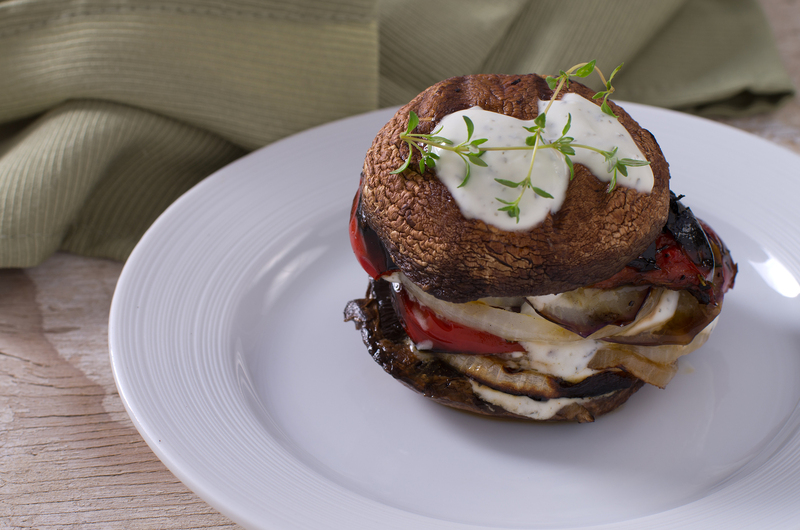 Did you know you can enjoy a hamburger using a Portobello mushroom as a bun? It’s a good alternative when you’re going lower carb. It feels like a real bun too. I usually use a lettuce wrap but that can get messy. And it’s hard to pull a leaf off of iceberg lettuce in one piece. Yes, I probably should just use romaine. But now I can have my burger with a bun. You can find the full recipe at Low Fat Low Carb. I’ve never added an egg into the burger patty. I always think of that more as a meatloaf ingredient. Have you done that? Does it make the meat moister? You can substitute ground turkey or chicken. In fact, you could do half ground turkey and half ground round or chuck. I remember watching a show on one of the cooking networks. They took 1/4 ground pork, 1/4 ground chuck and 1/2 ground round. Chuck and Round come from the muscles that are more used and have a beefier flavor. Jaques Pepin said his favorite burgers are made from ground brisket. You could cook up a salmon filet and use that in place of a burger. Some may call it a sandwich. I say you should do what you enjoy and if you’re grilling anyway, make what you want to eat. You can do so much to add in flavor. I love using Greek seasoning with feta cheese, tomatoes, and red onion. There are the purists that feel if you’re using great meat, all you need is kosher salt and a little fresh ground pepper. Again, do what you like. You should mix in the salt at least half an hour before you’re ready to shape the patties. Meat cooks better and more evenly when it’s closer to room temperature. Adding in the salt pulls out some excess moisture so you’re left with even more meaty goodness. I like adding in the seasoning when I add salt so the dried herbs can absorb that extra moisture and have a better flavor after cooking.